Richard Rti (1889-1929) was both a master player and a superb endgame composer. He was also a prominent member of the hyper-modern school and author of two of the greatest chess books ever written, Masters of the Chessboard and Modern Ideas in Chess. 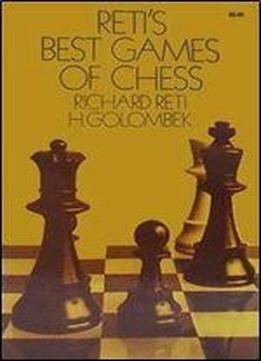 His games, which greatly influenced chess strategy, are known for their many innovations, beautifully developed combinations, and important advances in opening play and strategy. There are 70 games in this book, selected from all stages of Rti's career. Early games show the budding of Rti's almost phenomenal positional skills and his rise to status of great master with first prize wins at Kaschau and the international tournament of Gothenburg, 1920. There are many games from the tournaments of 1922, during the development of the Rti and the English openings including Rti-Rubinstein 1923, Rti-Becker 1923, Rti - Bogolyubov 1924, and his stunning defeat of Capablanca in 1924. The games from 1925 to his premature death in 1929 show his further development and number among them many which made the chess world sit up and take notice. Fifteen of Rti's most interesting composed endgames are also included. There is a short memoir and expert annotation by Harry Golombek. For this edition Raymond Keene has written a new Introduction.